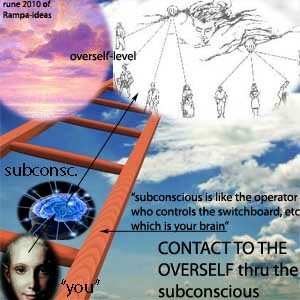 connection between the Overself and the subcons. the connection between the Overself and the sub - cons. "Let us try to get this clear for ever and a day or a bit longer; there is you who is just one - tenth conscious. You are bottom man on the ladder, or you might even be bottom woman on the ladder. Above you - you have your subconscious, and your sub­conscious is like the operator who controls the switchboard, etc., which is your brain. The subconscious is in touch with you through your brain - through your joint brain would perhaps ­be a better term - and the sub - conscious is also in touch with your Overself. So it's like you, the ordinary poor worker, who cannot get a word with the manager, you have to go through the shop steward or the foreman first. So you sort of hang around, try to make yourself obtrusive (iøynefallende) in the hope that the shop steward or the one above you will notice you, and wondering why the (you - know - what!) you are not at work will come and see what it's all about. Then you have to get your point of view over to the shop steward (tillitsmann) or foreman, and persuade him to take up your case with the manager or whoever is above him. This is similar to conditions with the Overself and you. Before you can get through to your Overself -you have to enlist the aid of your sub - conscious, and once you can convince your sub - conscious that it's really necessary for your joint good (fellesgode), then the sub - conscious will contact the Overself and the pendulum will be varied according to the indications which you are 'perceiving'. Incidentally, if you can get through to your Overself by way of the sub - conscious you can cure a lot of illnesses which you may have. The Overself is like the president of a company and he doesn't always know what minor ailments affect the lower departments. He knows it in times when conditions are very, very serious, but often he is in complete ignorance of some grievance, which the lower order of workers have. But if you can get your shop steward to take up the matter with the Over - self, or president, or general manager, then a grievance can be settled before it becomes serious. So if you have a persistent ache here, there, or somewhere else, then keep on at George Qr Georgina, say clearly what the trouble is, what is this pain, what does it feel like, why do you have it, and will the sub­conscious please see that you are cured. The Overself is the unapproachable. The sub - conscious is the link between you, the one-tenth conscious, and the Overself which is all conscious. "About astral travel and research into far past and the origin of things"
- here also about the origin of oil - "the black gold"- this is not as told by the "experts on earth"
Astral travel. Keep this in mind; when doing astral travel we are not in a flesh body, we are in a body, which can penetrate materials which, to the flesh body, would be solid. Do you understand the implications of that? It means that one can sink downwards at a controlled rate, sink down through the Earth and through solid rock. One can see with perfect clarity, although to a flesh body it would be complete and utter darkness. One can sink down and see perhaps here a giant figure, which was trapped half a million years ago and became em-bedded in what is now solid coal. In this solid coal, then, there is a giant figure intact, perfectly pre­served, as mastodons and dinosaurs have been pre­served intact. For years scientists have thought that the advent of humans, or humanoid races, on the Earth was fairly recent. But they have now come to the conclusion that humanity on Earth is much, much older than previously thought. Our travels through solid rock can tell us that, our travels can indicate to us this; after thousands and thousands of years the Earth goes into a sort of periodic convulsion during which the whole surface of the Earth trembles, during which waters recede here and waters rise there. The surface of the Earth seems to boil and seethe, and every trace of the Works of Man upon the Earth rises up and falls down, and gets buried hundreds, or thousands, of feet below the surface of the Earth. Housewives will understand when I say it is similar to making a big cake; you have a basin full of all sorts of unmixed ingredients, and then you insert a big spoon from the bottom and raise up, gradually mixing everything so that all the components, all the constituents, are dis­tributed throughout the cake mix. So, every half million years, or so, the Earth gets rid of unwanted stock and prepares the surface of the Earth for the next bunch, who, it fondly hopes, might be more successful. Life on Earth is old, the Age of the dinosaur and the mastodon and all those creatures was just the start of yet one more experiment, just as in thousands of years to come, this Earth will end as we know it at present. The whole surface will seethe and bubble, and the cities and Works of Man here will tumble down, and be buried thousands of feet below the surface so that anyone coming to Earth would say it was a new world which had never been inhabited. It takes a lot of experience to do this type of astral travel. But I can do it, and I can tell you that you can do it also if you will practise sufficiently, if you will have faith in your own ability, and if you will remem­ber that you cannot do it to bring back messages for other people at so many dollars a visit! I have seen deep down in the Arctic ice, hundreds of feet, or even thousands of feet below the surface, strange forms A different form of human, a purplish type of person with different characteristics from present day humans. Present-day humans have-just for example-two breasts and ten fingers. But I have seen purple people entombed absolutely intact, and they have had eight breasts and nine fingers on each hand. Probably some day research will exhume some of these people, and then there will be a nine-day wonder about it all. Some day there will be an atomic digging machine which will be able to excavate the ice, and show some of the people and some of the cities buried incredibly deep in the ice, cities of a people who lived and walked the surface of this Earth hundreds of centuries before there was any recorded history whatever on this Earth. This was a time when there was only one continent on the Earth, and all the rest was water. When South America and Africa were one, and when England was just a part of mainland Europe; when Ireland was just a mountain peak stretching miles - yes, miles up into the very different air. At one time all the world of land was one mass extending from the North Pole to what is now the South Pole. It was like a bridge linking one side of the Earth to the other. Australia, China, and America, all were one, all joined to what is now Africa and Europe. But in the earth-shakes, in the shivering tremors, which threw down civilisation and threw up fresh earth and rocks to hide that civilisation, and because of centrifugal effects, that one solid mass, that one continent of Earth, broke up. And as the Earth shivered and trembled, the seabed crept along, taking bits of land with it, land which became Australia, America, Europe, Africa, and so on. With practice in astral travel, with considerable practice in meditation, and combining the two to­gether, you can actually see all this as if you were in that item beloved of the Science Fictioneer - a time machine. There really is a time machine, you know, a very definite, working, time machine; it is the Akashic Record, wherein everything that has ever happened to this Earth is recorded. It's like having an endless number of cine cameras recording everything that ever happens, day or night, and blending them all together into one continuous ever-running film which you can 'tap into' by knowing how; and by knowing the age at which you desire to look. It is truly a fascinating thing to see a civilisation upon the Earth, a flourishing civilization, but one in which the people are very different from the humans whom we now are accustomed to see. In this par­ticular civilization, for example, people moved about not in motor cars, but on what may well be the origin of the old story about the flying carpet; they moved about on platforms which looked for all the world like mats. They sat cross legged on these things and, by manipulating a little control, which looked like a woven pattern, they could rise and soar off in any direc­tion. In the Record we can watch all this, and then as we watch we have an effect just as if some clumsy per-son were shaking a chess board on which all the men were set up for a good game. As the chess-board men would tumble so did the people of the then-Earth tumble. The Earth itself yawned, great gaping chasms appeared, and buildings and people toppled in, and the Earth shuddered and closed up. And after a time the heaving and rolling of the surface ended, and the Earth was ready for the next 'crop'. In this form of astral travel, also, one can go deep deep down into the Earth, and one can see perhaps in­tact afterfacts of that Age, or remnants of large build­ings. One can go to Arctic or Antarctic regions, and go deep down and find people and animals who have been quick-frozen to death, and because of the cold and the quickness of the onset of the cold, they have been preserved utterly intact as if they merely slept and waited a shaking hand to awaken them. As one looks one can see different chest developments, different nostrils, because the atmosphere of the Earth a few million years ago was very different from what it is today. People of today would not be able to live in the atmosphere of those times, just as people of those times would not have been able to breathe the atmosphere which we now optimistically call 'clean air'. Then there was far more chlorine, far more sulphur, in the air. Now we get the stink of petroleum fumes. think it sounds far out....- well - on the website of the norwegian spacesenter- we can read about just such oceans of oil on the MOON OF SATURN- TITAN !!! - LINK ON NORW | engl link on that.| alt. have an extension to your bedroom. Overself connected to an astral and to a physical body. big dog and that would correspond to the Overself, the astral, and the physical....."